It is never easy to know when to put on a production of The Mikado, the Committee is always keen to have it on the future shows list because it consistently does well at the box office but, as it comes round so frequently, members tend not to be too enthusiastic about performing it yet again – with all that in mind, the lively Hot Mikado seemed to be a sensible compromise. The Echo reviewer seemed to agree with much of this, as she reported: ‘Katisha (Marlene Hill) commanded the stage with her severity and stunning, soulful voice. There was a nice stand-off between her and Pitti-Sing (Abigail Miller). But the real treat was in the second act, when paired with Ko-Ko (Matt Sturgeon), who held his character (and accent) throughout, providing endless comedy (in a good way!). 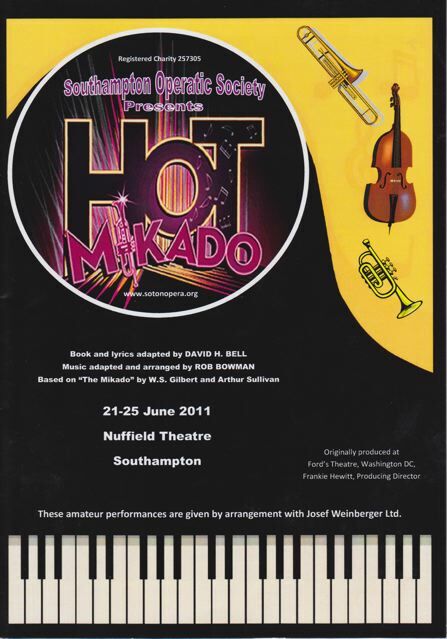 It did not help that the country had just entered a recession, nor that the weather was hotter than usual but Hot Mikado, despite some truly magical moments, was not very well supported and made an overall loss of £3495.